Pricing may vary for other states. We have been authorized to sell for 9 of the largest suppliers in the industry, to reach as many customers as possible! Garage, Fully Enclosed 24 X 31 with 11' Walls. In the Carport Industry, structure lengths (on standard, Horizontal Roof models) are listed to include a 6 overhang on the front and rear-- In other words, the frame is one foot shorter than the roof: A 21' long model has a frame that is 20' long. This is a Fabulous Structure for anyone looking for a Garage and Workshop! These ALL STEEL Structures come in many sizes and offer lots of options to fit your needs. The model in the photo and described in this listing is a 24' Wide and 31' Long all steel structure with Boxed Eaves, 11' legs and braces on the 4 corner legs. This popular model features two 10' Wide and 10' Tall Roll-up Doors, a 36"x80" walk-in door, and four 24"x36" windows. Your New Garage is constructed from 14 gauge Galvanized Steel Framing, 29 gauge Steel Panels and a Decorative Steel Trim. 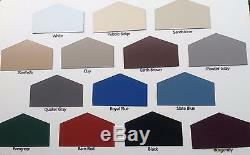 You will have 14 colors to choose from on your Walls, Roof and Trim, so matching your surrounding decor is never a problem. There are lots of options to choose from, such as: Extra Height, Width, Length, Additional Doors and Windows, and more! We are able to serve most of the United States (prices may vary). Professionals are standing if you have any questions. Thank you for shopping at "mybuildingdesigns"! "Your Reliable Source for Dependable Shelter". Tell your friends, because we appreciate your business and your referrals! You may VISIT OUR STORE by clicking on the little red door inside the listing! Certified Models are available upon request to meet all State and Local Codes! Prices may vary in some states. Most of our listings are priced for 12 of the southern states in the U.
AL, AR, GA, KY, LA, MS, NC, SC, OK, TN, TX, VA. We also have many items in our store that are priced for other states and will have a specific state designated in the title. It is the customers responsibility to obtain any necessary permits. Please view our page for "Pricing your Building". Modifications and revisions may incur additional cost. OH, NE, IA, WI, W. MD, Most of CO, PA, NM, CA, W.
We are choosing NOT to deliver and install in the following states at this time: ND, SD, RI, NH, CT, VT, DE, ME, and MN. We apologize for the inconvenience. Other products offered will be found in our Portable Building line which are offered in Texas and surrounding areas. All that we require is a level surface (within 3"), and that there is at least 18"-24 of space between the structure and any existing structure. There must be a certain amount of orders on a load, in order to send the installers out for deliveries. Estimations are educated guesses, based on the experiences of the scheduler for your area, and they do their best to predict a schedule before it is written! So we appreciate your patience and cooperation! Some important things to remember. The scheduling date is not set until the scheduling office confirms the appointment with you, at least 3 days in advance. Every estimated date that we give you before that is ONLY an estimation. We do our best to keep customers informed and updated. Even when the scheduling office calls you to confirm your appointment, it is STILL possible that your scheduled date can change, due to unforeseen circumstances. PLEASE try your best to NOT take off of work for the installation date. Please try to have someone else available for the install, or mark out the spot where the building needs to go. It is best to have someone at the site for the installation, but you do have a 30-day workmanship guarantee... If you are not able to be there, and you notice something that needs to be corrected, all you need to do is let us know! Even the best suppliers can experience delays or mechanical issues. In our experience, the most important thing is the way that these rare situations are handled. The item "24x31 STEEL Garage, Storage Building, with 36 WI door FREE DEL. AND INSTALL" is in sale since Tuesday, September 24, 2013. This item is in the category "Home & Garden\Yard, Garden & Outdoor Living\Garden Structures & Shade\Garden & Storage Sheds". The seller is "buildingdesigns4all" and is located in USA. This item can't be shipped, the buyer must pick up the item. Brand: Brand depends on your location.